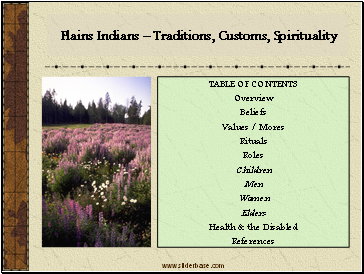 American Indian life is centered on the four seasons and the natural world. Traditional spirituality is not a ‘religion’ so much as it is an integral seamless part of the very being of Indian society. 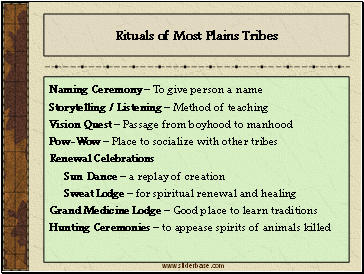 Native spirituality and beliefs are sacred. To use them in any way other than the way they were intended would be sacrilegious. 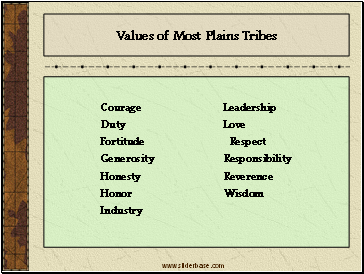 Learning to live in the traditional ways is not easy. 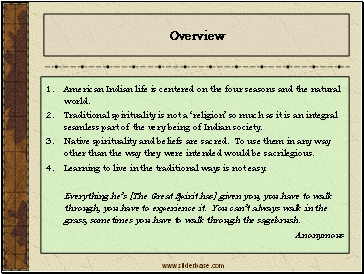 Everything he’s [The Great Spirit has] given you, you have to walk through, you have to experience it. You can’t always walk in the grass, sometimes you have to walk through the sagebrush. 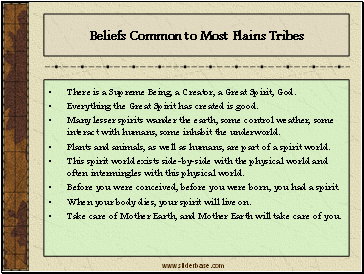 There is a Supreme Being, a Creator, a Great Spirit, God. Everything the Great Spirit has created is good. Many lesser spirits wander the earth, some control weather, some interact with humans, some inhabit the underworld. Plants and animals, as well as humans, are part of a spirit world. This spirit world exists side-by-side with the physical world and often intermingles with this physical world. Before you were conceived, before you were born, you had a spirit. When your body dies, your spirit will live on. Take care of Mother Earth, and Mother Earth will take care of you. 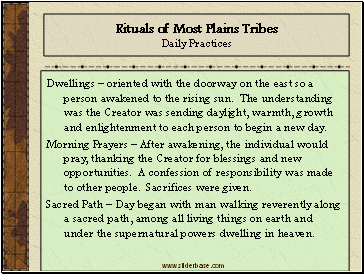 Dwellings – oriented with the doorway on the east so a person awakened to the rising sun. The understanding was the Creator was sending daylight, warmth, growth and enlightenment to each person to begin a new day.